Wealth advisers using the iGP wrap account are able to have perpetual recurrent income in the form of an annual wrap fee from managing their clients' investment portfolio. Recurring income from wrap and trailer fee provides a more stable source of income, in contrast to 'One-off commission', which is generated from each transaction (e.g. one time upfront fee). The amount of wrap fee chargeable is directly correlated to the performance of the portfolio. Thus, it successfully aligns both the client's and the adviser's interests to grow the portfolio. As the wrap account offers free switching, clients will be more willing to let you manage their portfolio through regular rebalancing. Recurring Income model helps you build your business step by step. 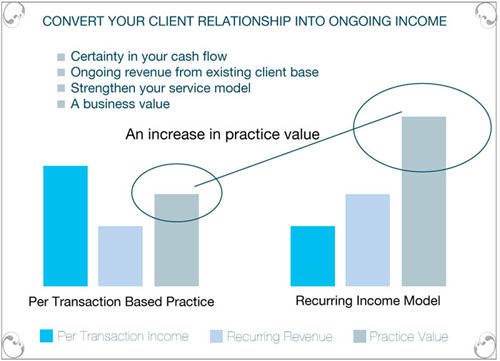 The value of the business will grow with the strength of the relationships with your clients and the size of your clients' assets under advice. The higher the recurring income, the higher the value of your business. As the value of your business grows to a reasonable size, you will be able to sell or transfer your business value to other wealth advisers when you retire.